Cape Town attractions have made it a famed destination for many Hollywood & Bollywood stars and diverse global travelers alike. Take a trip to on the Cape Winelands and taste South Africa's homegrown wines; see the world from your vantage point on the top of famed Table Mountain; dine like a king at any of South Africa's fantastic restaurants and celebrate the great outdoors even during the winter months. 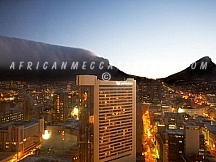 Below is a listing of Central City & Suburbs Cape Town accommodations in South Africa. 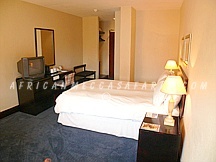 To view complete details on the accommodation, click on "Read More+" under each hotel photo. Andros Boutique Hotel is a gracious Cape Dutch homestead, built in 1908 and designed by Sir Herbert Baker. Restored and updated, carefully preserving its old-world charm, the house is set in large, mature park-like gardens in die heart of Claremont, one of Cape Town's beautiful Southern suburbs. 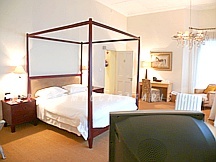 Set in the garden are eight spacious bedrooms, each with its own veranda and view over the lush garden. Cape Town Hollow Hotel is situated in the historical center of Cape Town. The hotel is two minutes on foot to trendy restaurants, clubs and bars in Kloof Street and Long Street, five minutes on foot to St George's Mall or the chic Gardens Shopping Center. 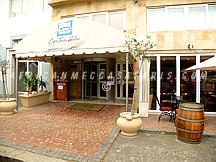 The hotel has 56 en-suite rooms (bath/shower combinations) with open-air balconies. 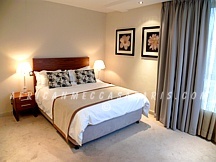 Each room is Individually controlled air-conditioners and heating. 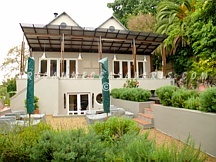 Four Rosmead is an exclusive guesthouse situated on the slopes of Table Mountain in the select residential suburb of Oranjezicht. 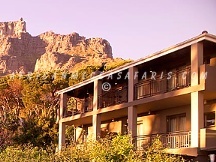 The guesthouse enjoys 360º views of the mountain, Lions Head, Signal Hill, Table Bay and the city. It is within walking distance of the city as well as vibrant Kloof Street, which is well known for its restaurant and café culture. 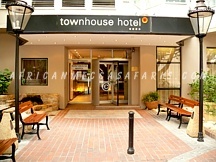 Hollow On The Square Hotel is situated in the heart of the beautiful city of Cape Town. Walking distance from the Cape Town International Conference Centre (CTICC) and the well know V&A Waterfront. Hollow on the Square, Cape Town City Hotel offers stylish and modern accommodation in warm welcoming shades of red and the finest amenities to ensure a comfortable stay. 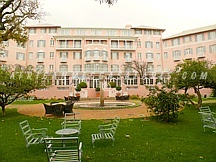 Mount Nelson Hotel is the most iconic luxury hotel in Cape Town situated within a sprawling lush garden estate in the heart of the city's vibrant cultural centre and close to the bustling V&A Waterfront and some of Cape Town's best beaches. The hotel boasts 6 individual accommodation wings, each with its own unique character, private gardens and facilities. The 201 spacious rooms & suites are individually decorated. Mandela Rhodes Place is a unique concept of modern living, with a subtle blend of old and new. 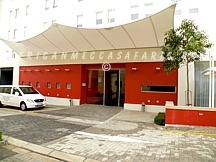 It is located in Cape Town's bustling city centre offering a unique modern apartment city lifestyle with hip, chic 21st century deluxe apartments. This trendy, vibey establishment offers self catering apartments fully equipped with the most modern conveniences one would expect from a typical "New York" style apartment. 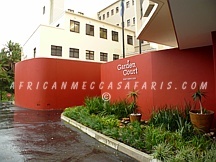 More Quarters Cape Town offers the combination of apartment living with the service and hospitality of a hotel. 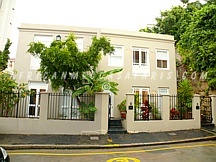 The apartments are ideally located just off Kloof Street, referred to as the 'heart of Cape Town' by the locals. This is partly due to the area being relatively untouched by mainstream tourism, hence adding to the authenticity and value of the Kloof Street address. Protea Hotel Fire & Ice prepares you to be blown away with the same force as the winds of the iconic Cape South-Easter as you step into the ultra-cool hotel . This extreme comfortable, in the heart of the vibrant Mother City, offers adventure-seekers attention to detail, personal service and never forgetting to seize life. Townhouse Hotel is Cape Town's most perfectly appointed hospitality venue for both business and leisure. 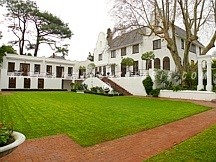 The hotel is set in a surprisingly tranquil corner of the city center, adjacent to the South African Parliamentary precinct and the historic oak-lined avenues of the famed Dutch East India Company Gardens, established some 350 years ago to offer provisions and respite to visitors to this port. 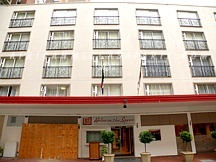 Inn At The Square Hotel is conveniently located on the historic Greenmarket Square in the vibrant business and government district in Cape Town. It is the ideal central base for exploring historic sites such as Robben Island, the rock paintings along the Western Cape and the beautiful beaches along South Africa's coastline. The hotel has 165 fully-equipped guestrooms designed for your convenience. What are our Customers saying about our safari vacations?